being little • bristol uk fashion & lifestyle blog. : which way to be happy. I was thinking of just wearing (mostly) black on my trip to London tomorrow, and even thinking of styling my hair in a topknot now that it's long enough. But then I remembered that that would be REALLY BORING (no offence..) and not very "me", so I'm going to wear one of these outfits instead. I'm loving that now that it's pretty much Autumn, I can wear boots, tights, skirts and coats... YAY! The first outfit is definitely my favourite. Really lovely autumnal colours and anything with my Wallpaper Rose tee is a winner in my opinion. The skirt is from Zara, and the boots I got from New Look yesterday, as I wanted some suedey boots with a heel. I was looking for a wedge heel ideally, but these are really growing on me. Below, I'm wearing a Zara cat print shirt, a piece of lace as a bowtie, and an H&M skirt. I like this outfit but not as much... the colours just look dull compared to the first one! Also, if you missed my post this morning there are now kittens, prints and lots of vintage goodies in the Being Little Shop! The first outfit is a winner in my opinion as well! Have fun my dear! The cat print shirt is adorable! The first one is my fave, I love the peter pan collar and the browns. I really need some new boots for autumn, I get so excited about it! LOVE that cat print shirt! I love this time of year too because I love wearing tights with everything. I even stocked up on some knit tights to make the transition to winter easier and less sad. I love the first outfit too! 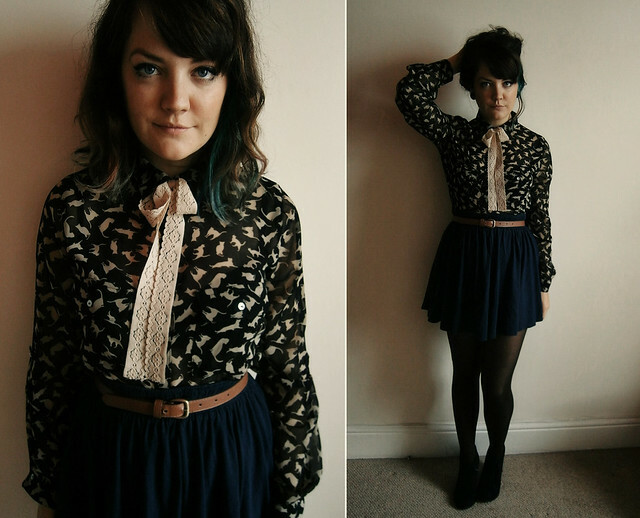 But I like the lace bowtie so much - its so cute, and makes me want to do the same with my sheer tops!! Have fun! but I love the first one! Oh I love both the outfits. I think if I had to push I like the first most, the colour of the skirt is so gorgeous although I do love the little lace bow on the second outfit! I love both outfits, but I think I like the second best, swayed by that gorgeous shirt! I really really love that coat, so nice!! Love the first one a tiny bit more, I think it's the colour of the skirt. Enjoy London! Stunning outfits, as always! I keep regretting buying that coat when I saw it last year, it is so lovely! Eek so hard to choose, because you look an absolute treasure in both! BUT personally I'd go for the second one.. purely because of the beauty of a shirt that you own! I adore cats,and you look so cute! Ah, the second outfit is so so perfect! Have seen those Peter Pan t-shirts somewhere before and was racking my brains trying to remember where so that I could get one so thank you! Firstly, I LOVE that Zara cat shirt - I've been looking for it on ebay for months!!! Secondly, that coat is amazing!!! these outfits are both gorgeous lyzi :) the colours work really well!